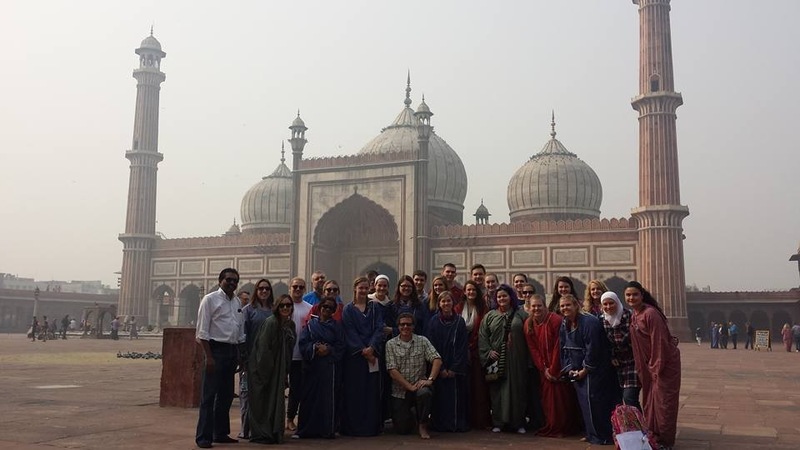 During J-Term, a group of 24 students and two professors were given the opportunity to study eleven and a half hours across the globe in the country of India. In the months before the trip, the expectations dreamed about were nothing in comparison to the actual country that the group experienced firsthand. Between the culture, the history, and the people, a new perspective was placed before them, one that will likely affect them for the entirety of their lives. The trip started on Jan. 4, the first day of J-Term. After two seven-hour flights and a five hour layover in Frankfurt, Germany, they finally arrived in Delhi, the capital of India. Smog was the first culture shock they encountered as one could see the haze it created down the hallway in the airport. Besides the air, Delhi had so much to offer. They visited mosques and temples, mausoleums and museums in Delhi and throughout the entire journey. Since the class focus was on Gandhi, the group went to the Gandhi Smriti, which is where Gandhi lived the last 144 days of his life before he was assassinated on the grounds. With the building transformed into a museum and the grounds dedicated as a shrine, it was both an informative and an emotional site. Next, the DuHawks took the bus to Agra, home of the famous Taj Mahal. While this mausoleum was impressive with the intricate marble inlay and the precision of the entire grounds (only a 2% error), this 400 year old monument was only one of the many Mughal structures they were awed by everywhere in India. Agra also gave them the wonderful opportunity to visit Sheroes Café, a restaurant that employs acid attack survivors. 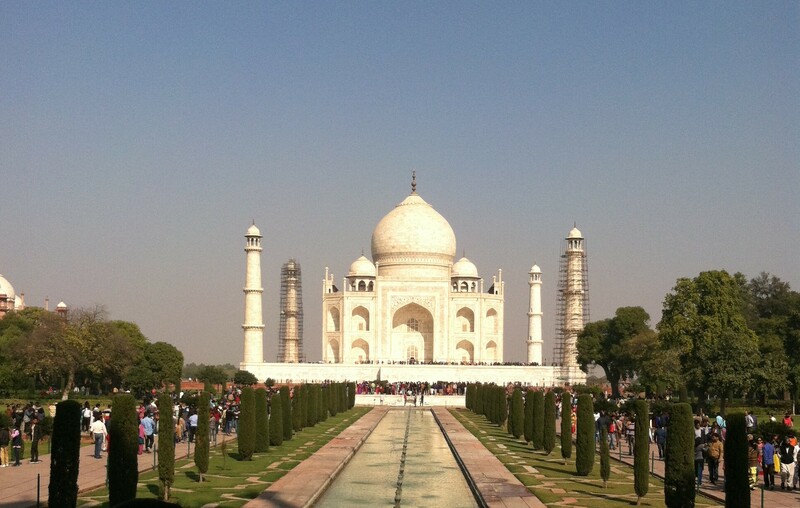 Before the trip, many in the group were completely unaware of this horrible problem in India. The women they met at Sheroes Café had a beauty of their own as they were able to look beyond their scars by empowering themselves through their work and pursuit of their dreams. From Agra, they drove a few hours to catch the train that would take them to Rathambore National Park, the tiger preserve which is home to many other Indian animals such as the sambar and spotted deer, crocodiles, a variety of birds including peacocks, antelope, wild boar, sloth bears, and langur monkeys. Between two safaris, the group was able to see all the animals either up close or at a distance. That night at the hotel, they even witnessed a traditional Indian song and dance. The group then drove to Jaipur, one of the more modern cities in India. Here they visited one of the famous forts, the Amber Fort. Of all the sites visited, many agreed it was their favorite. Between the elephant ride up to the fort, the intricate painting along the walls, and the room of mirrors, they couldn’t help but love every moment of it. Jaipur also led them to the Monkey Temple which felt like a scene from the Jungle Book. Lastly, they flew to Ahmedabad, the southernmost stop during the trip. During those six days, they centered their focus on Gandhi by visiting the Gandhi Ashram, the community of equality he founded and lived at for many years. They also met with Fr. Prakash, a Jesuit priest who has worked to peacefully instill interfaith relationships in Ahmedabad, specifically after the massacre in 2002. While Muslims and Hindus have lived in the same country for hundreds of years, their history is not without conflict. They were fortunate to visit Fr. Prakash as only four days later he would be leaving India to work as a missionary in Lebanon to help with the refugee crisis. He also invited the group to say mass with him at the Mother Teresa Ashram Home for the Sick and Dying Destitute where they talked with two of the Missionaries of Charity as well as met some of the men living there. Finally, on the last full day in the city, they were granted the opportunity to walk through one of the slums. Here they met with a group that works to educate and care for those living in this extreme level of poverty. However, the students were surprised to see that, despite the poverty, everyone was joyful. 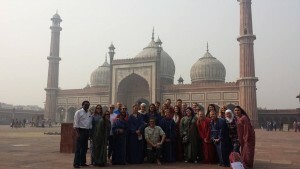 Overall, the trip to India was one of the most life changing experiences for many, if not all, in the group. These DuHawks experienced a different culture by walking through the streets, learning the history, and loving the people through their brief interactions. Yes, they got stares from many people because they were different, but they learned how similar everyone is. The culture was so colorful and tasteful that many said they would love to visit again. For now, they will have to be content with the moments they created during their fifteen days in India.